Friends who read this site often ask me about how I sustained a head injury. I looked back and realized I haven’t ever written about it. The first two happened back when concussions and all forms of “closed head injuries” were poorly understood. Then in 1987 I was T-boned – meaning a car ran a red light and rammed into the drivers side of my vehicle. My head slammed against the side window and I was thrown around a bit (within the confines of the seatbelt). I was diagnosed with a concussion and whiplash. Ironically, those two accidents happened on the same day, June 6th, 8 years apart. Neurological damage is cumulative. The more you injure your brain the more profound and cumulative the damage can be. I never would have thought to mention those two incidents but to anyone who deals with brain injuries they think those first two accidents are quite significant. In 2002 I was rear-ended while my car was fully stopped. The big mistake I made was that when I heard the guy hitting me I jammed my head against the headrest because I did not want to whiplash. Don’t ever do that! When the head is held still the force of the accident propels the brain back and forth in the skull. The occipital bones are pretty sharp which is why prefrontal cortex damage is extremely common in traumatic brain injury. 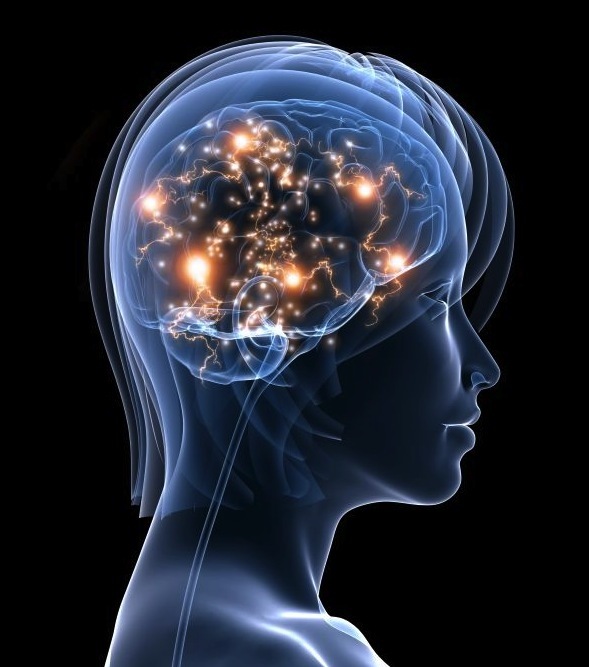 The prefrontal cortex houses the executive functions which are discussed in the next post. In 2003 I did a banana-peel slip down a couple of stairs. Instead of breaking my fall, I focused on trying not to spill the plate of food in my hands on my friend’s new furniture. Uh, Don’t ever do that either! I broke three vertebrae when my back hit the stair edge. My head then collided with the floor causing yet another concussion. In 2004 I accidentally got married. You laugh! It’s true! Due to a mixture of the brain injury and my doctor being adamant that I had to take vicodin to break the chronic pain cycle my body was in by that time, I was not exactly thinking clearly. I married a fellow in under 30 days of knowing him. Bad move! I’d say “Don’t ever do that”, but most people probably wouldn’t! The marriage lasted less than a year but long enough to sustain more head trauma (and have him gamble away my retirement savings). In 2005, while we were in our storage locker, the ex accidentally dislodged a large roll of carpet we had placed up on top of everything. Luckily he yelled “Look out!” so I straightened up – otherwise I would probably be a quadriplegic. As it was, the carpet roll came down directly on top of my head. Scariest (and the most painful) thing I have ever been through! I was transported to the hospital on a backboard and diagnosed with yet another concussion as well as whiplash. Who knew you could get whiplash from having a carpet dropped on your head? Ex and I were moving into one of Vashon Island’s unique houses. It had been a two-story chicken coop that was converted to a house; a large house at that. But the second floor had essentially been a hay loft. It had a sloping ceiling and very deep dormers. Even the shower was built into a dormer so you had to reach for the soap at the edge of the tub then remember to back up into the dormer before standing fully upright. Needless to say, I bashed my head many a time. I even remember thinking that I felt like I was doing damage to my brain but I quickly would chide myself that the thought was foolish and people would think I was silly if I ever said anything. So I didn’t. There were other subsequent falls or hard head bangs. Once a person has a brain injury they are more likely to fall or misjudge a distance and hit their head. Thankfully things are better now because I have received excellent care at the TBI rehab unit at Seattle’s Level 1 Trauma Center; Harborview Hospital. My balance and vision are improved so I am no longer such a danger to myself.